Pot Mountain and Siwash Creek. Click on the image to enlarge and zoom. Curving along the southwest corner of Pot Mountain, the Siwash Creek Roadless Area creates a 9,000 acre irregular triangle in the North Fork of the Clearwater River drainage and is composed of the characteristic steep stream-bank landscape. There are only 2 second and third-order streams; the rest are first-order streams draining directly into the river or other larger streams. 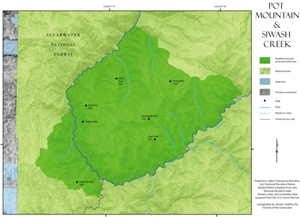 From the 2,200 feet elevation at the North Fork, the land rises rapidly to just over 5,000 feet at Clarke Mountain. 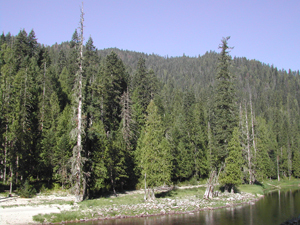 The overall low elevation means the cedar-hemlock-pine ecosystem dominates and also supports rare Coastal Disjunct plant communities, such as Western red cedars, that are remnants of plant life that thrived far inland from the Pacific Coast up until the ascension of the volcanic Cascade Mountains several million years ago. The natural boundary of the river and the network of streams create valuable habitat for threatened Bull trout, Inland redband trout, and cutthroat trout. Elk, mule deer, and black bears roam the creased countryside. This rare and critical river ecosystem needs protection, as most of it has been lost to logging, dam building in Dworshak, and other development. Its proximity to Pot Mountain to the east and Bighorn – Weitas to the southeast, makes Siwash Creek a substantial consideration for wilderness designation.